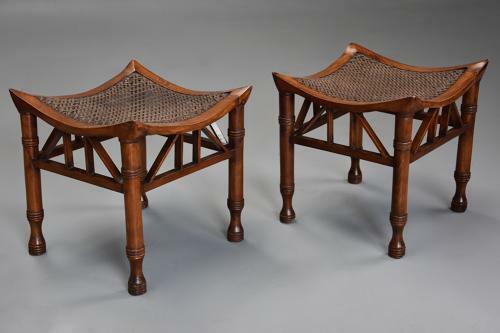 This pair of stools consists of shaped rattan seats with shaped frames with turned legs and decorative stretchers. The inspiration for the Thebes stool was the collection of Egyptian domestic furniture discovered at Thebes which had been acquired by the British Museum between 1829 and 1835. This collection included a stool with shaped inlaid legs and fragments of a leather seat, this stool apparently inspired various 19th century designs. Liberty & Co. patented the design for the Thebes stool in 1884, this became an iconic design for the store and it continued to be sold by them into the early 20th century. The first Liberty catalogue known to exist was produced in he early 1880's and this celebrated Oriental & Egyptian items and also set the fashion for the store for many years. Examples of these stools from Liberty & Co. can be seen in the book: 'Liberty's Furniture 1875-1915, The Birth of Modern Interior Design' by Daryl Bennett, pages 25,96,97 etc. This pair of stools are in very good condition for age, are of stable construction and can go straight into a home.